I need help. I want to chance my patio screen but the spline it's too old and with exposure to the sun, heat and water from the outside it has become impossible for me to remove the old splice. What can I do?, Is there a product to help me remove it? Removing old brittle plastic screen spline is not fun but I find its easier with a good heavy duty utility knife. I use the knife to cut right the spline from top to bottom. You have to press hard to cut right through. The spline usually falls apart as you are cutting it. You need to make several cuts until the spline just falls out in small pieces. Sometimes just crumbs. 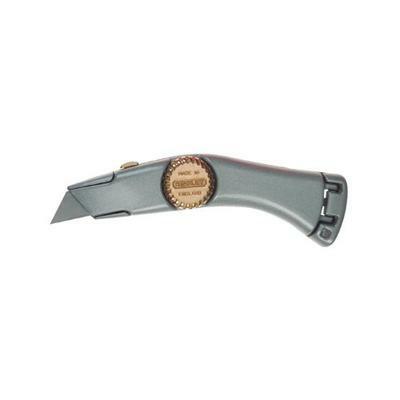 The thick handle on the Stanly knife makes it easier to hold onto and control when you are using a lot of pressure. I also use a sharp pointed awl to dig out all the stubborn little pieces that wont come out easily after the knife. You could do the job with a smaller regular knife but you would have to be really careful to keep it from jumping out of the spline channel and possibly cutting yourself. However you look at it, its a nasty messy job. Put a drop cloth under the screen before you start so the mess doesnt get everywhere. I got do agitated when the spline started to break after only about 6" or so pilled out. First thing I thought was,"Use your head and either wet it or spray with WD40". By wetting it, I was afraid it would get worse and I didn't want an added mess. After spraying WD40 all around, I used pliers and it pulled out with ease. I did pull from an angle other than a straight uo and out pull. Tried everything, pliers, knife, ice pick under the spline. Tried one of the Drimmel attachments that wouldn't harm the aluminum, inch by inch. NOTHING worked save to remove a few inches or less at a time. WD 40 worked. Someone on here suggested it and it worked. It didn't slide out. It pulled out. There is screen under that spline, it all came out. I am thinking of getting 1x2 pressure treated wood pieces, like the old fashioned screens were made. Screw them INTO the aluminum frame inside the lanai, 3 screws would be enough for a long piece I think, if not, perhaps 5. Then simply staple gun the screen to that wood. Easy to fix, easy to replace, no spline. I recently had some screens in my patio enclosure become damaged by Hurricane Irma. The spline & screens were installed in 2008 after Wilma. The spline on some of the panels was totally brittle and dry. If I try to yank up a piece and pull it out with a plyer, it cracks off. What has worked for me is WD-40 sprayed along the entire length of the spline. I then took a 1/8" inch screwdriver and a hammer and was able to get the spline moving in the slot back and forth. I then popped out a small piece and slid the whole thing out sideways (or vertically depending on whether working on a horizontal or vertical section). I had a hard time with the spline crumbling and thought I could soften it. At first I tried a little WD and oil on a removed piece, no luck. I considered the heat gun, but only for a moment, then I went for the tea kettle. Boiled some water, made a few passes along one edge, took an ice pick and slid it right under and the whole side came out. repeated on the other 4 sides. You can also try a narrow slot screwdriver. The smallest standard one is 1/8" which will get into most spline grooves. You may find that sharpening one side to a chisel edge to get under the edge will help.